Some people say that to be feminist means to reject all social conventions typically ascribed to being feminine. You reject all that being a female entails and instead take on a more self-empowered independent role; you’re fearless, you don’t need anyone’s help, you’re your own woman. That’s all fine and dandy, but wanting equal rights for men and women does not necessarily mean you have to reject everything the label ‘woman’ stands for. Enjoying activities that are stereotypically considered feminine – often evoking the ‘you’re such a girl’ label of mockery – does not make anyone less of a woman. If anything you circumvent the label of hard-line feminist and indulge in being the woman you want to be. You sport the tag ‘you’re such a girl’ both proudly and ironically because, guess what haters, you’re fervently feminine and not ashamed to be. Be badass, be independent while, simultaneously, being a girly stylish diva. 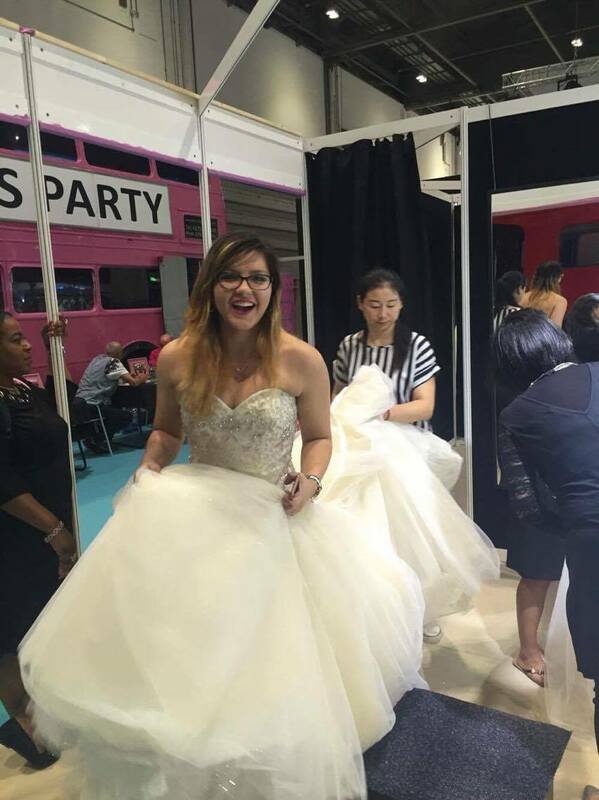 Last weekend, an event called The Wedding Fair took place at the Excel centre in South East London. It featured a catwalk with dresses from leading designers such as Allure Bridals, Hayley Paige, Ian Stuart, Eliza Jane Howell and many more. The elegant models were gliding like dainty swans along a meandering river. They strutted forward with their perfected catwalk stride and owned every garment put on them. There were the sleek curve-hugging mermaid dresses that accentuate a woman’s every aesthetically pleasing asset, there were the looser A-line dresses that hug the top of your body and ripple over the bottom-half but are they are not as fabulously poufy as the ball gown princess dresses. Our generation was born in the ‘90s, so the princess gowns are the ultimate reminiscent reminder of the era of Disney frocks on all our favourite princesses – the Cinderellas, the Ariels, the Belles, even the Pocahontases (if you brave getting married in a short dress) – can feel a slight bit of tingling nostalgia at this event. It might not be every girl that has pedantically planned every minute detail of her wedding, not all of us fixate on the flower debacle – roses, lilies or something else entirely, on the chicken or fish debate for food, or on the assortment of mind-boggling colours available for the bride to torture her bridesmaids with. Not every girl dreams of the perfect wedding, but indulging in a girly day and letting yourself wonder once in a while never hurt anyone. While at uni, we’re all young and (when not under immense academically-induced panic) are most likely not thinking about marriage yet. Nonetheless, in the next ten years or so you will probably meet the person that may unhinge your whole life plan – you may have decided that your 20s are all for building your career, and then when approaching your thirties, mid-thirties or later, you may want to find a guy who’ll willingly be the fly in your Venus flytrap and then even have kids. But life’s volatile and altogether unpredictable and so we never know exactly what will come our way. So for whenever we – ladies and gents – meet our partner that we decide to upgrade from temporary to permanent status, aka marriage, then it may make sense to allow your mind to wander and indulge in the feminine-labelled tradition that is weddings. Or if all of that sounds a tad too serious, then a wedding show is still a fun place just to hang out. I was a full-on tracksuit-wearing no jewellery kind of tomboy when I was young so you can imagine my mother’s relief when I finally complied to wear dresses when puberty hit. Still, my mind can get bogged down when it comes to being too girly and a wedding show is something I was interested to see – because who doesn’t love a bit of Say Yes To The Dress reality TV – but was not sure how brave I could be at the event with unleashing the cowering girly-girl inside me. I decided to do some soul searching and coerce her out entirely. I seized the chance to feel like a princess and not be one bit ashamed. I tried on a wedding dress. I picked the ball-gown dress with the fluffiest fullest skirt and the most eye-blinding bedazzled embroidered corset because if you’re going to go hard or go home, you go all out. For anyone interested in attending The Wedding Fair, give it a google and see when and where it’s on again. ← What did CUB do this summer?